Library members and guests are cordially invited to celebrate this new exhibition devoted to the legendary women’s suffrage movement, a crusade that culminated in 1920 with the ratification of the 19th Amendment. Author Brooke Kroeger speaks about the roles of both men and women in that historic struggle. More about the exhibition here. 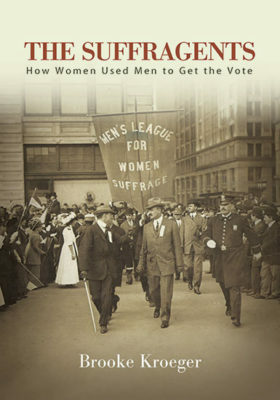 Library member Brooke Kroeger is the author of The Suffragents: How Women Used Men to Get the Vote, which won the Gold Medal in U.S. History in the 2018 Independent Publisher Book Awards. Kroeger is a professor at New York University’s Arthur L. Carter Journalism Institute. The evening will also feature a one-night display of Members' Loans having to do with the suffrage movement. We encourage you to look in closets, cupboards, and attic trunks for suffrage memorabilia, including posters, banners, pins, books, photographs and letters. Blow off the dust and bring them to us. To arrange for the loan, please contact Harriet Shapiro, Head of Exhibitions, at hshapiro@nysoclib.org or 212-288-6900 x221.